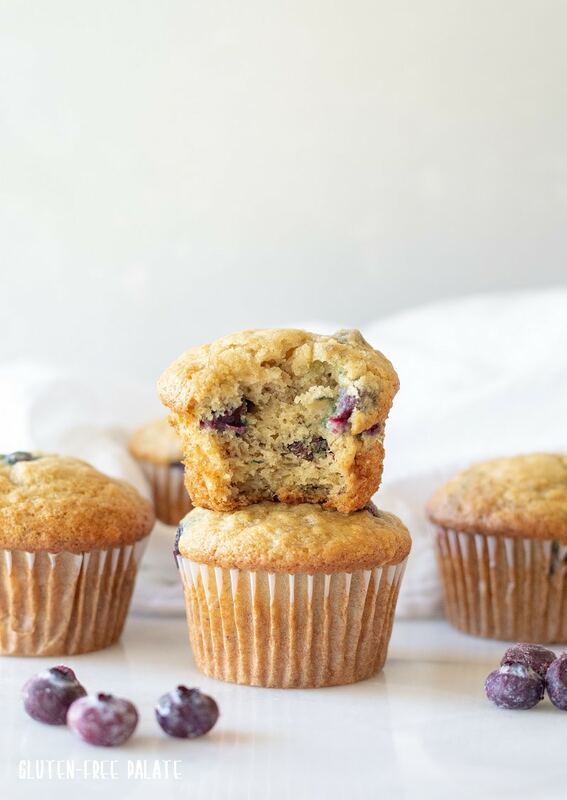 Tender, simple to make and bursting with tangy blueberries, this gluten-free blueberry banana muffin recipe is going to be your new favorite go-to muffin recipe. These are the best gluten-free blueberry banana muffins and you’ll think so too once you see how easy they are to make. If you love gluten-free desserts and gluten-free muffins and breads made with bananas you’ll want to check out my Gluten-Free Banana Bread. This recipe post was sponsored by Bob’s Red Mill. Opinions, recipe, and photos are my own. 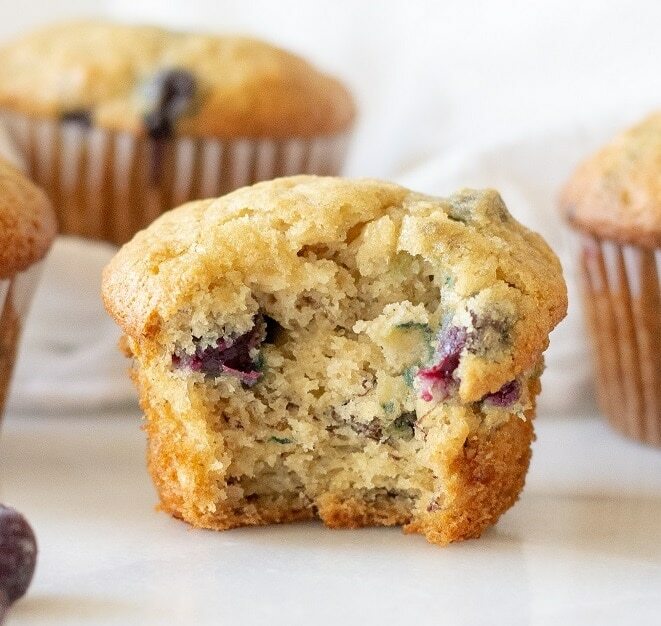 These gluten-free blueberry banana muffins are simple to make, don’t require a mixer, and use minimal ingredients that you’ll find in most gluten-free kitchens. This gluten-free blueberry banana muffin recipe is a spin off of my gluten-free banana muffins published in my cookbook. 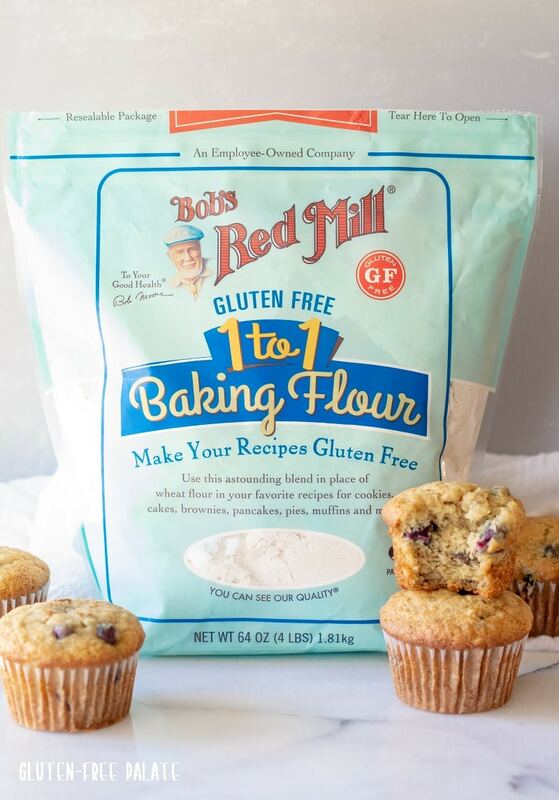 I recently improved the recipe and modified it to use Bob’s Red Mill Gluten-Free 1-to-1 Baking Flour because we use Bob’s Red Mill products in most of our cooking and baking. In this recipe the Gluten-Free 1-to-1 Baking Flour delivers a fluffy, scrumptious gluten-free muffin. I should mention that this recipe is naturally dairy-free and nut-free, and you can use coconut sugar in place of the sugar to make these gluten-free blueberry banana muffins refined sugar-free. 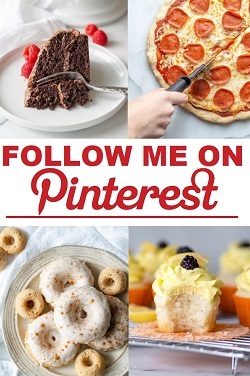 You can skip down to the recipe if you want but I encourage you to read through this post. 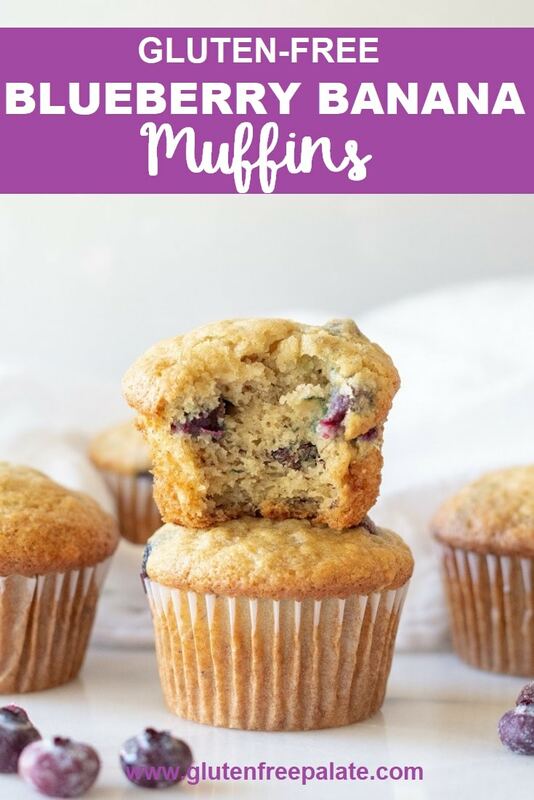 It has some tips and tricks for making the best gluten-free blueberry banana muffins that I think you’ll want to see. Use fresh ingredients and always check labels. Read the recipe before you begin. Ingredients at room temperature work best. You can use fresh or frozen blueberries. Let your oven site for 5 minutes after it preheats. This helps the temperature to even out in the oven. 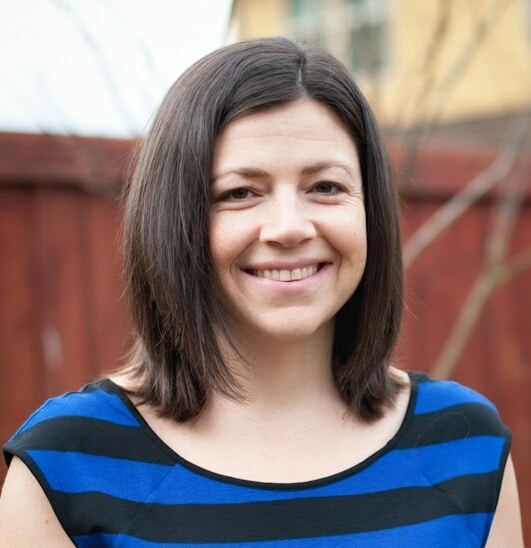 If you make any substitutions other than what I’ve tested with you are doing so on your own but please feel free to leave a question in the comment section below if you need help with anything. The one egg in this gluten-free blueberry banana muffin recipe plays an important role in the texture. If you can’t have eggs you can use a flax egg, 3 tablespoon of water + 1 tablespoon ground flax seed. Let the mixture sit for 15 minutes before using. 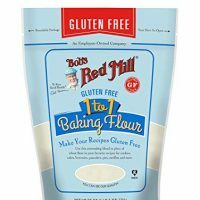 When working with or measuring gluten-free flour, spoon the flour into the measuring cup and level. Do not scoop your measuring cup into the gluten-free flour. The best method really is to weigh the gluten-free flour but I don’t have the ingredient weights for all my recipes yet. 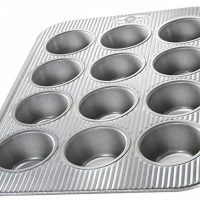 I have a silicone muffin baking pan and a metal muffin baking pan. I find that the silicone pans take longer to heat up, causing the muffins to take a little longer to cook. For these gluten-free blueberry banana muffins I recommend using a metal muffin baking pan. 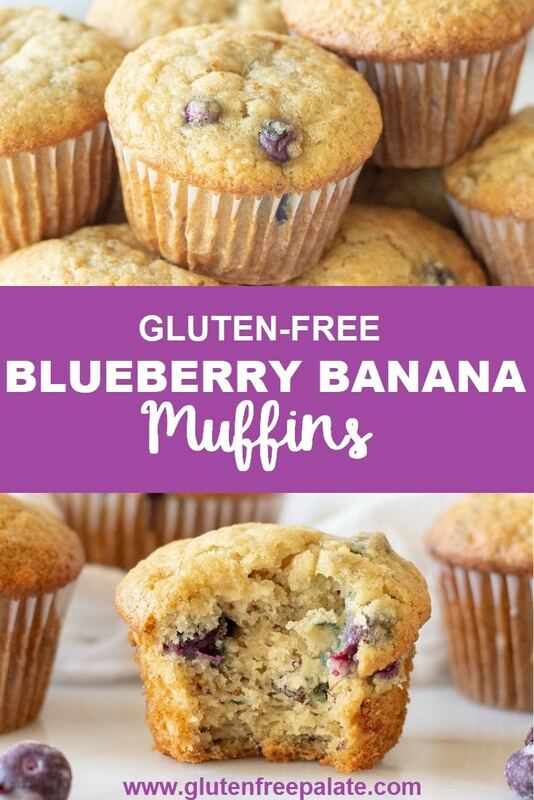 With both types of pans you’ll want to use paper liners when making this gluten-free blueberry banana muffins recipe. Line a 12-serving muffin pan with paper liners; set aside. In a medium mixing bowl combine your ingredients. Spoon the batter evenly into each cupcake pan, about ⅔ full and bake. That’s it! Super easy, right? It takes less than 10 minutes to get these gluten-free muffins in the oven. For detailed steps and ingredients consult the recipe below. 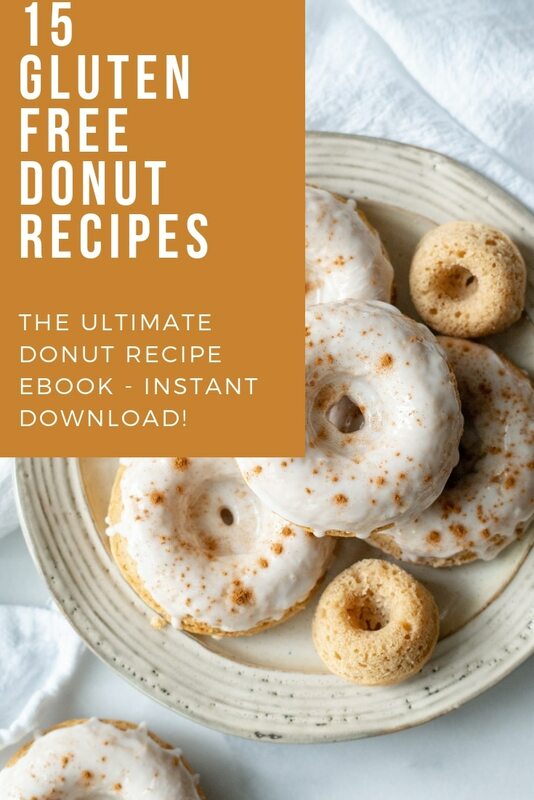 If you love to make gluten-free recipes using bananas you might like to try some of my other gluten-free banana recipes. If you have a ton of overripe bananas to use you should check out this Gluten Free Banana Bread French Toast Recipe. If you love bananas AND pie you’ll want to make this Dairy-Free Banana Cream Pie. Did you make these gluten-free blueberry banana muffins? If so please leave a comment and a starred review and let me know what you thought. Also, if you have any questions about this recipe or any of my recipes feel free to leave a comment and I will get back to you. 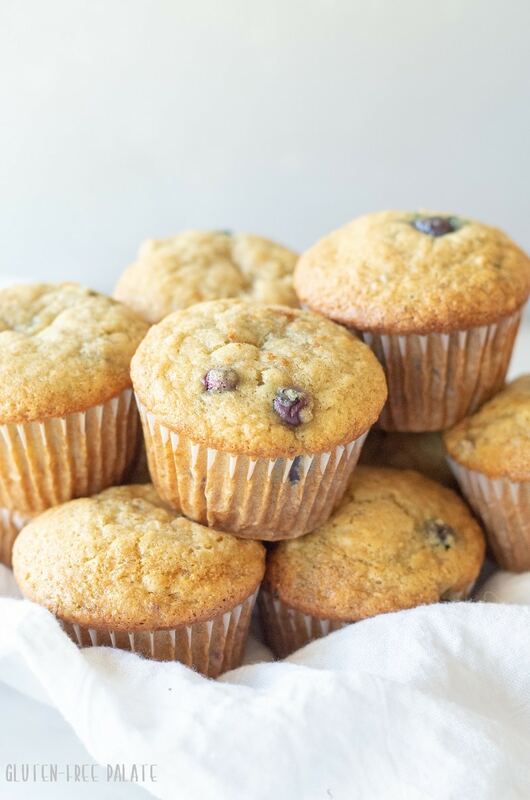 Easy Gluten-Free Blueberry Banana muffins that are dairy-free, nut-free, and have a vegan and refined sugar free option. Preheat oven to 350°F (180°C). Position the oven rack in center of oven. 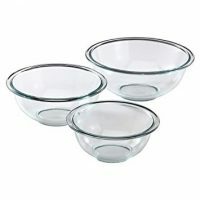 In a medium mixing bowl combine flour, baking powder, baking soda, and salt. In a separate large bowl whisk together egg, sugar, oil, mashed banana, applesauce and vanilla extract. Add the wet ingredients to the dry ingredients and stir just until mixed. Fold in the blueberries. Spoon the batter evenly into each cupcake pan, about ⅔ full. Bake for 22–25 minutes or until a wooden toothpick inserted near center comes out clean. Egg-free option: mix 3 tablespoons of water with 1 tablespoon of ground flax seed and let it sit for 15 minutes before using. Muffins will be denser, but tasty. Refined sugar-free option: replace the granulated sugar with equal parts coconut sugar. You can use your oil of choice in this recipe, but if you don't have oil use 1/3 cup of melted butter or dairy-free butter. You can use fresh or frozen blueberries in this recipe. This recipe works best with a metal muffin baking pan. « Gluten-Free Florence: Restaurants and Bakeries in Florence! I love blueberry and banana together in desserts! Looks so delicious! Thanks for stopping by Natalie! This is the best banana muffin recipe I’ve ever made. My sister couldn’t even tell it was gluten-free. Thank you! Awe, I’m so glad you to hear it! Thank you for stopping by to leave a review. 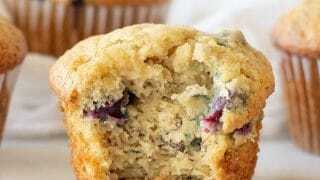 I’ve tried other gluten-free blueberry banana muffin recipes and this one is by far the best. Thank you! I am so glad you like these muffins! Thank you for stopping by to let me know.